Jeannie Seely and Willie Nelson have been friends for many years, and Jeannie is honored to be represented by an exhibit in the Willie Nelson and Friends Museum. Among the many Willie Nelson songs that Jeannie has recorded are “I’m Still Not Over You”, “Our Chain Of Love”, “Mr. Record Man”, “Don’t Say Love Or Nothing”, “Healing Hands Of Time”, and “Little Things” (the title cut of Jeannie’s fourth album for Monument Records). 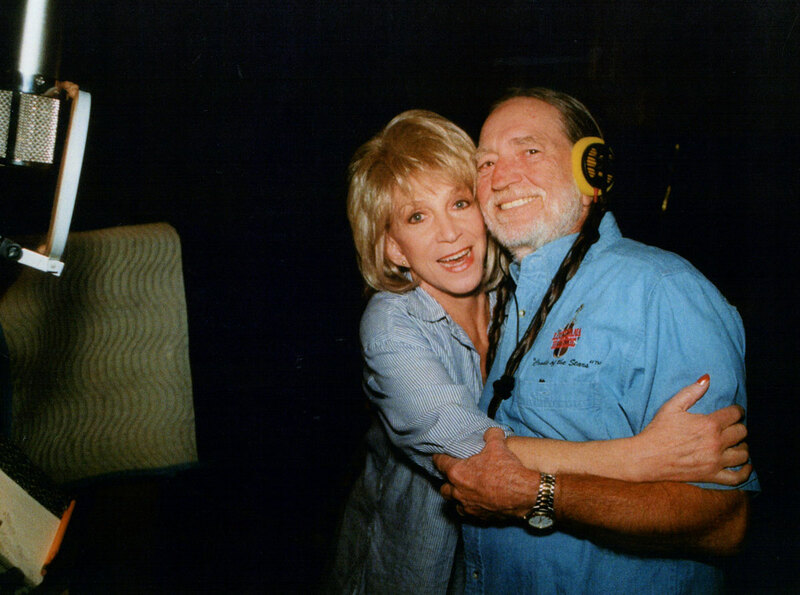 Country star Jeannie Seely hugging good friend Willie Nelson during a recording session in Nashville, TN. Two of Willie’s compositions, “What A Way To Live” and “Funny How Time Slips Away”, were also recorded by Jeannie for her Vintage Country CD which was released in 2011. “I can never sing enough Willie Nelson songs”, writes Jeannie in the CD’s liner notes. Jeannie has often performed “What A Way To Live” (a 1968 Johnny Bush hit) and “Funny How Time Slips Away” (a 1961 Billy Walker hit) on the stage of the Grand Ole Opry. She explains that “Funny How Time Slips Away” came about when she was asked to perform a tribute to Billy Walker on the Tuesday Night Opry following his death. She dedicates the song on her Vintage Country CD to Billy and his wife Bettie, as well as to Charlie Lily and Danny Patton, all of whom died in the fatal accident that occurred in May 2006. For her CD project titled Been There…Sung That, Jeannie asked Willie to perform the Roger Miller classic “Old Friends” as a duet. A alternate version of Willie Nelson’s “Heaven And Hell” with guests Jeannie Seely and Sammi Smith went unissued for over 30 years until 2006. At that time it was included as a bonus track when Willie’s Phases And Stages album was released as part of The Complete Atlantic Sessions. The song was recorded at the Nugget Recording Studio in Goodlettsville, TN. “When Will I See You Again” is a showcase for this devil-may-care cowgirl’s vibrant voice and straight-from-the-heart songwriting talent. Recording with Willie Nelson’s people, she is as effective a song interpreter as The Red Headed Stranger himself. The pair’s styles compliment each other on“You’ve Been Leaving Me For Years”. Seely’s urgent, hoarse lamentation opens the song, instantly riveting attention on the lyrics. Then Willie’s battered, weary vocal of a man at the end of a relationship takes over. Musical memories are made of moments like this. 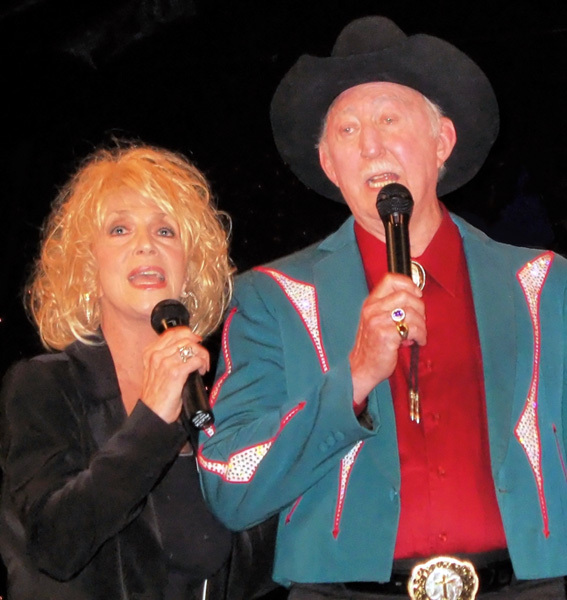 “You’ve Been Leaving Me For Years”, the duet by Willie and Jeannie, was included on Jeannie’s Personal CD. Among many achievements – including a Billboard Award for “Most Promising New Female Artist” – Jeannie Seely can claim No. 1 country songs as a solo artist, as a duet partner, and as a songwriter. Her recording of “Don’t Touch Me” not only hit the top of the charts, but also earned her the 1966 Grammy Award for “Best Female Country & Western Vocal Performance”. Jeannie’s version of “Don’t Touch Me” is ranked at No. 97 in Country Music’s 500 Greatest Singles published by the Vanderbilt University Press and the Country Music Foundation Press. With fellow Opry member Jack Greene, Jeannie scored another chart topper in 1969 with “Wish I Didn’t Have To Miss You” which launched one of the most popular duos and road shows in country music. Jeannie and Jack performed together for over a decade at venues including New York City’s Madison Square Garden and London’s Wembley Arena. Willie Nelson recorded “Senses”, a song that Jeannie co-wrote with Glen Campbell, and it was included on his 1970 album Laying My Burdens Down and on his 1998 box set Nashville Was The Roughest. In 1972, Faron Young took “Leavin’ And Sayin’ Goodbye” to the No. 1 position, earning Jeannie a BMI Songwriter’s Award. 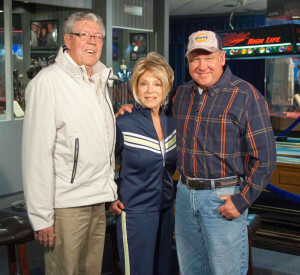 In addition to Willie and Faron, other Country Music Hall of Fame members that have recorded Jeannie’s compositions include Ernest Tubb, Merle Haggard, Ray Price, and Little Jimmy Dickens. Artists including Dottie West, Tex Williams, Jack Greene, Norma Jean, Lorrie Morgan, Johnny Carver, Connie Smith, Irma Thomas, Doyle Lawson, Hank Williams Jr., Chris LeDoux, and many others have recorded Jeannie’s songs as well. In 2006, the Reunion of Professional Entertainers (R.O.P.E.) named Jeannie their “Songwriter of the Year”, and the following year she received their “Entertainer of the Year” award. Along with placing records on the Billboard charts for 13 consecutive years, Jeannie has also served as a radio disc jockey on her own Armed Forces Network Show, traveled on military tours throughout Europe and Asia, made numerous appearances on national television shows, published her own book of witticisms titled Pieces Of A Puzzled Mind (which was reissued in 2011), and starred in numerous musicals and stage productions. In the early 80’s, Jeannie performed as the opening act for Willie Nelson’s concert dates across the country. She also appeared in Willie’s Honeysuckle Rose movie and sang on the soundtrack recording, a contribution for which she received a platinum album. 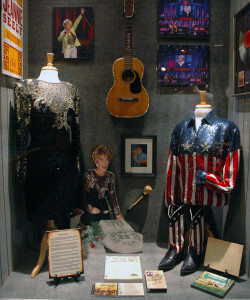 Today that platinum album is part of Jeannie’s exhibit at the Willie Nelson and Friends Museum. Known throughout her career as an individualist, as well as for her infectious humor, Jeannie is widely recognized for changing the image of female country performers. Great friend and long time Grand Ole Opry star Jeannie Seely. Jeannie is credited for wearing the first mini-skirt on the Opry stage, and she was the first female to regularly host segments of the Grand Ole Opry. To this day the petite, blonde singer nicknamed “Miss Country Soul” remains the only Pennsylvania native invited to become a member of the Opry cast. Country Weekly magazine praised Jeannie’s bluegrass-flavored album saying, “Life’s Highway is a thoughtful, inventive acoustic winner that’s a much-needed slap in the face for anyone who might have forgotten how Jeannie earned her gig as one of the friendliest faces on the Grand Ole Opry. Her Vintage Country CD received similar praise, including these notes from Today’s Country: “Grammy winner and Grand Ole Opry legend Jeannie Seely has managed to do it again. For over 15 years Jeannie lived along the Cumberland River in a house that Jeannie renovated from a fishing camp. In May of 2010, Jeannie lost her home, car, and personal belongings in the tragic Nashville flooding. 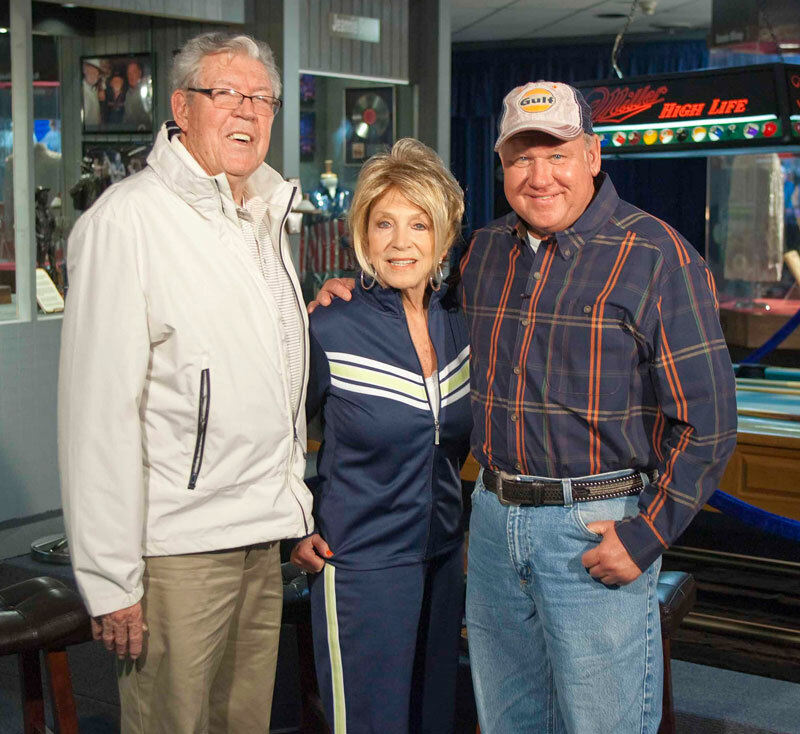 Grand Ole Opry star Jeannie Seely alongside husband, Gene Ward and TV host Kenny Dean in the Willie Nelson and Friends Museum in Nashville, TN. Jeannie refused to focus on what was gone, and instead she was thankful that she and her dog Cheyenne were safe. She immediately started making plans to rebuild her home, and one of the first in line to lend a helping hand was her old friend, Willie Nelson. The future looks a lot brighter these days for Jeannie, who moved back in her home four months after the flood and married attorney Gene Ward in November 2010. Jeannie Seely maintains a website at JeannieSeely.com and can also be found on Facebook at Facebook.com/JeannieSeely. Information and photos contributed by Ron Harman. 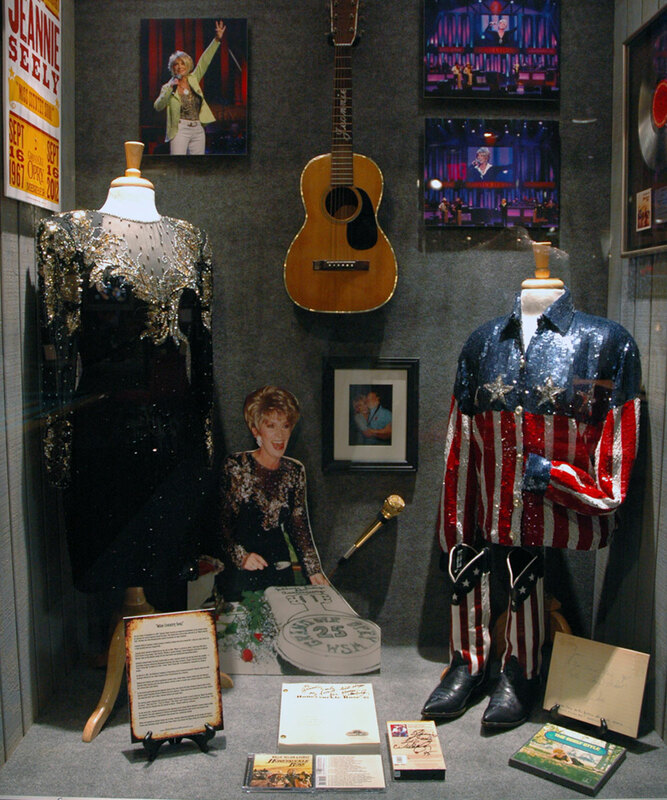 In addition to Jeannie Seely, the Willie Nelson and Friends Museum displays and exhibits honor the likes of Webb Pierce, Johnny Cash, George Jones, Waylon Jennings, Porter Wagoner, the Wilburn Brothers, Faron Young, Patsy Cline, David Frizzell, Mel Tillis and many, many others.